Senior Israeli defense officials are publicly proclaiming the reliability of their Arrow anti-ballistic missile interceptor in what appears to be a clear deterrence warning to Iran not to try and launch any nuclear missile strike against the Jewish state. The Arrow 2 anti-ballistic missile system is capable of intercepting and destroying any Iranian missiles, even were they to carry nuclear warheads, a high-ranking Israel Defense Forces officer told The Jerusalem Post. While Iran was now Israel's most serious strategic and existential threat, Israel was sufficiently protected by the Arrow, which plays a major role in maintaining Israel's protective envelope, he said. "We will shoot all of [Iran's missiles] down," he told the Post. "The Arrow knows how to intercept the Shihab missile." The increased Israeli confidence follows an ambitious crash program that was undertaken last year to upgrade the Arrow, which is co-produced by Israeli Aircraft industries and Boeing. Appearing before the Knesset's Foreign Affairs and Defense Committee last year Brig. Gen. Ilan Bitton -- head of Israel's Air Defense Forces -- admitted that while the Arrow was highly effective against the Scud missiles that make up most of Syria's arsenal, it "needed improvement" to face the challenges posed by Iran's Shihab-3. However, in December 2005, Israel carried out a highly successful test of the upgraded Arrow-2 system against a ballistic missile configured to perform like a Shihab-3. Reflecting the success of that test, the Israeli officer it was now able to detect even a missile carrying a split warhead and armed with decoys meant to fool the anti-missile system. 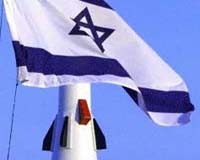 Asked about the danger of the Arrow taking out a non-conventional or nuclear missile over Israel, the officer said that the incoming missile would be destroyed at such a high altitude that it would disperse and destroy its payload without causing any casualties, the Jerusalem Post said. "There is constant pressure to always stay a step ahead of our adversaries," the officer told the paper. "They developed decoys on their missiles and we developed ways to detect the decoys and to be able to accurately strike the incoming threat." The Arrow 2 was last tested in December and succeeded in intercepting an incoming rocket simulating an Iranian Shihab at an altitude higher than ever before tested in the previous 13 Arrow launches. While the Arrow was Israel's first line of defense against an Iranian-launched missile, air force Patriot batteries -- known for their action during the first Gulf War -- also followed incoming missiles and served as the country's back-up interception system. Israel has at least two operational Arrow batteries, with reportedly hundreds of missiles for each battery. One is stationed at Palmahim to protect Tel Aviv and the other is at Ein Shemer near Hadera in the north, the Jerusalem Post said. The Missile Defense Agency this week will conduct a test off the Pacific Missile Range Facility of an Aegis Ballistic Missile Defense Program rocket with nose-cone electronics developed by Japan, the Honolulu Advertiser reported Tuesday. Unlike previous tests, this one -- named Joint Control Test Vehicle-1 -- will use a simulated target programmed into the rocket's computers rather than a real target launched from the ground, the Advertiser said. The Aegis cruiser USS Lake Erie, which will be at sea off Kauai, will track the virtual missile and launch a Standard Missile-3 that is fitted with the Japanese-built clamshell nose cone. The instrumentation in the nose cone includes heat sensors, three cameras, telemetry equipment for sending data back to the ground and equipment to measure the shock experienced by the warhead. Components in the system were developed by Raytheon and Mitsubishi Heavy Industries. The U.S.-Japan cooperative research effort in ballistic missile defense started in 1999, the newspaper said. The Missile Defense Agency has conducted seven previous launches, all against actual rocket targets. Six of those resulted in intercepts. The most recent test, on Nov. 17, 2005, involved an intercept of a separating target. Previous tests were against single-stage, non-separating targets, the paper said. Japan's Defense Facilities Administration Agency is asking the Aomori prefecture and the Tsugaru municipal governments to host a U.S. military radar for missile defense at Japan's Air Self-Defense Force base in Tsugaru, Aomori Prefecture, the Japan Economic Newswire reported March 2. Agency officials were visiting the northeastern Japanese prefecture last week to make the formal request to have the mobile X-band radar for an advanced early warning system against ballistic missiles deployed at the ASDF base, local sources told JEN. The Aomori prefecture government is expected to consider the matter through discussion in the prefecture assembly and holding a presentation session for area residents, it said. The radar will use a frequency called X-band to detect ballistic missiles immediately after launch, track them and identify projected landing points. Though it will emit electromagnetic waves, there will be no influence on people if an off-limits zone covering a radius of about 100 meters were to be set up around the radar and there will be no disruption of radio or TV transmissions, JEN said. A senior U.S. Missile Defense Agency official said in early February that the United States planned to deploy the radar in Japan within six months as part of bilateral missile defense cooperation.